In Apache Tuscany, we have been experimenting with Google Android Platform to build Mobile SOA Applications, and we now have couple Android based samples that demonstrate a Android mobile application consuming SCA services available on the cloud. Store-android: A front end to our "Store Getting Started Guide" that consumes the catalog and shopping cart services and allow you to shop for fruits and vegetables. SCATour-android: A front end to the "SCA Tour" scenario that allows you to search for trips direct from your Android phone. - In the dialog that appears, click the Available Software tab. - On the subsequent Install window, "Android DDMS" and "Android Development Tools" should both be checked. Click Next. - Read and accept the license agreement, then click Finish. 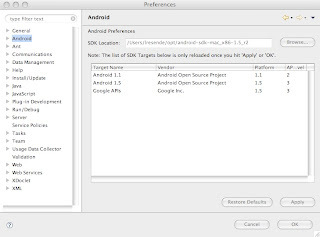 - Point to the directory where you installed the Android SDK in step 1. You you should be ready to run Android applications. Now let's add the Tuscany Android samples to your Eclipse IDE and run it. You should now have your Android Fruit Store up and running, accessing the Catalog and Shopping Cart services from the regular store application we have started in step 3. - Tuscany Getting Started Guide : The Fruit Store Application scenario. I also want to give the special Thanks to our 2009 GSoC Student, Lookman SANNI, for the recent updates to the Store-Android sample and ui. Raymond Feng is a senior software engineer with IBM. He is now working on the Service Component Architecture (SCA) runtime implementation in Apache Tuscany project as a committer. Raymond has been developing SOA for more than 4 years and he was a key developer and team lead for WebSphere Process Server products since 2002.